Finance Minster presented his fourth annual Budget 2017 in the Parliament on 1st February. Let us showcase what is in store for the mango people or “Aam Aadmi” under the highlights of the Budget 2017. The common man went through a major reform of Demonetisation last year which lead to many hardships, troubles, uneasiness to the common population of the country. 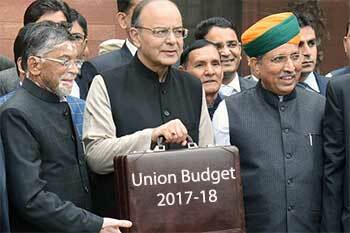 With the onset of the budget 2017, common man had major expectations from the Finance Minister of India. The Finance Minister presented his fourth annual Budget 2017 in the Parliament on 1st February. Let us showcase what is in store for the mango people or “Aam Aadmi” under the highlights of the Budget 2017. Finance Minister in his recent budget move provided a tax relief to the individual assesses falling in the income bracket of 2.5 Lakh to 5 Lakh by slashing the current tax rate from 10% to 5%. This move will reduce the overall tax liability for the individuals earning up to Rs 5 Lakh per annum. So, for a person earning 5 Lakh per annum, the tax liability which was Rs 5,150 (for the Assessment Year 2017-18) now has reduced to only Rs 2,575 (for the Assessment Year 2018-19) including education cess. This move in the budget has a uniform impact and benefit on the succeeding tax slabs as well, which is about Rs 12,875 per individual (inclusive of cess) earning above Rs 5 Lakh. For exceptionally higher income strata of the population, the impact of the tax continues. A surcharge of 10% on individuals whose taxable annual income ranges between Rs 50 Lakh and Rs 1 crore. For the individual assessees whose income exceeds Rs 1 crore, a surcharge of 15% is levied. An increment in the tax deduction limit for rent paid under section 80GG is also a main highlight for the common man. It has increased from Rs 24000 per annum to Rs 60000 by the Finance Minister which will offer a great relief to the people who live in rented houses. Tax deduction on the additional interest of Rs 50,000 per annum is announced for the benefit of the home buyers. The additional interest of Rs 50,000 per annum for loans up to Rs 35 lakh sanctioned in 2016-17 for first time home buyers, where the cost of the house is below Rs 50 lakh. Simplification of Tax Return Form is also announced which suggests a simple one page form which needs to be filled while filing tax returns for the strata of non business individual assesses falling in the taxable income slab of up to Rs 5 Lakh. The holding period for immovable property for the applicability of long-term capital gains tax has been decreased to 2 years from 3 years. Also, tax will be levied for unoccupied houses a year after getting completion certificate. To move forward in attaining a pensioned society, Finance Minister in his recent budget offered tax exemption for the 40% amount of the corpus accumulated under National Pension Scheme (NPS) which can be withdrawn at the time of retirement. For the provident funds, including employee provident fund, a similar regulation of tax exemption on a withdrawn amount of 40% of the corpus applies which has been created out of the pension fund contributions made on or from 1st April 2016. The pension amount which is attainable by the legal heir will also be tax exempted. Apart from this, the limit for contribution of employer in the recognized Provident and Superannuation Fund of Rs 1.5 lakh per annum is applicable for taking tax benefit. National Pension Scheme and EPF also attract service tax exemptions for the annuity services provided to employees. There is a decline in the service tax rates from 3.5% to 1.4% applicable on the single premiums payable towards the Single Premium Annuity Insurance Plans. The government intends to patch up with the Life Insurance Corporation of India to devise a scheme for senior citizens with a robust 8% return on an annuity amount which again leads us to a major leap towards a pensioned society. The new health insurance scheme is announced to be launched to safeguard people against hospitalization expenditure which is a big relief to combat aggravating health care costs. The announced health care scheme will offer health cover up to Rs 1 Lakh per family. For senior citizens, there is an additional cover in the new healthcare insurance scheme in the form of a top-up package up to Rs 30,000. Yet another push towards the Digital India can be seen as the Finance Minister has withdrawn the service charges for the tickets booked through IRCTC website, making the cost of tickets cheaper and affordable if booked online. The common man will have great benefits for an economy’s shift to Digital India in multiple ways. To encourage Aadhaar based payments, especially for those who do not have a credit or debit card, banks are encouraged to introduce 20 lakh Aadhaar based POS by September 2017. So, paying by punching in your Aadhaar number will soon turn into a reality for the masses of India. Another important announcement in the Budget 2017 was that the Aadhaar-based Point of Sale terminals would be set up. Senior citizens will get Aadhaar smart cards which will also show health details on the cards. Cash transactions above Rs 3 lakh not allowed as per budget 2017. Lastly, the aspirations from the budget related to the increment in the tax deduction limits under Section 80 C & 80 D did not materialize, but tax relief for people earning up to 5 Lakh per annum was a major highlight. The budget 2017 showed an inclination and was pro common man’s budget.Move towards a digital platform will certainly benefit the common man in the long run and the country as a whole. Overall, the budget 2017 gave a good start to the year post the major reforms in last year like Demonetisation and GST. The author, Harjot Singh Narula, is Founder & CEO, ComparePolicy.